Even nowadays, although the internet is not a new phenomenon but the now leading technical medium, many problems especially in the fields of copyright are still unsolved. 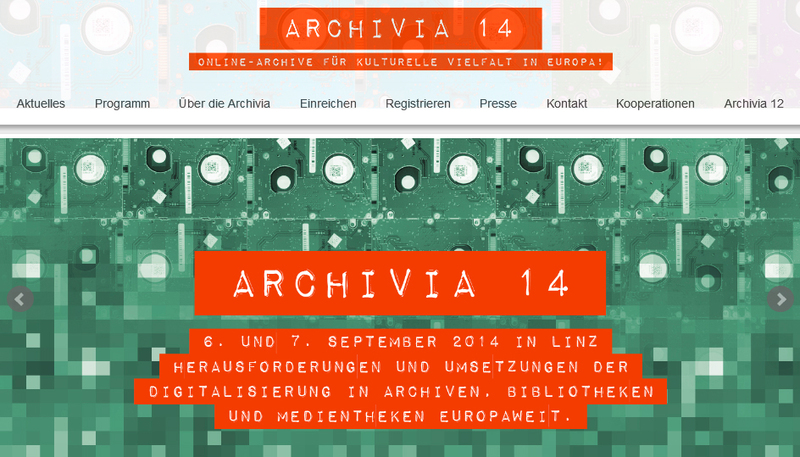 Especially for this reason, the makers of the CBA founded the conference Archivia in 2012, which aimed not only to put a spotlight on Europes free media archives. It also pursued a long-term goal in connecting different media archives to find a common ground for political action. The funding of this EU project was a direct result of this action. The conference convened by the Austrian Association of Independent Radio Stations (VFRÖ) and Radio FRO in the context of ARS Electronica Festival 2012 (The Big Picture) was held on 31 August and 1 September 2012 in the Wissensturm Linz. Since digitization, much has changed in the structure of information and communication. One of the strongly affected areas are archives. What was discussed was not only the technical implementation and durability of digital archives, but also their social function. Whereas for a long time, archives were accessible only to a limited public and consequently irrelevant for the chain generating royalties and revenues, digitization and, above all, the internet offer the potential for opening up archives to the public worldwide. Whether these archives, made available worldwide, impair the chain generating royalties and revenues or not depends upon the content made accessible; a film archive available worldwide can impair the generation of royalties and revenues, just as it can do in musical or literature (e-books). Other archives, such as radio station archives, can be made available to the public without disturbing generation of royalties and revenues from the materials used (the inputs). If, for example, music is played in the background of a conversation, or even simply played on the radio in the program-breaks, presumably no one would listen to the radio program in the online archive instead of buying the CD or MP3 file. Especially in the area of public radio and independent, non-commercial radio stations, a question arises concerning the sense of copyright barriers to access. In both cases in Europe, public financial means are deployed to produce the programs because they are regarded as being socially relevant. Because of copyright limitations relating to making content available on the internet, however, providing open public access to program archives is highly restricted and, in many cases, practically impossible. Even though public moneys are deployed and the use of relevant program-content for linear transmission (terrestrial transmission and live-stream) is appropriately remunerated, apparently, permanent availability is still not possible. The private interests of the copyright owners (even though the potential for generating royalties is not curtailed) are placed above the public interest in information which is manifest also in the statutory public assignment and the public financing of non-commercial, independent radio stations. At Archiva 2012, problems with archiving content or making it publicly available were illuminated and potential solutions discussed in workshops. Renowned keynotes by scientists, philosophers and experts like Manfred Faßler, Ruth Towse and Till Kreuzer threw light on the problem from the perspectives of media studies, economics and the law. The contribution from media studies showed the social function of archives, the significance of public accessibility and changes thereto in the past two decades. The contribution of economics concentrated on possible inefficiencies and problems of welfare economics triggered by copyright. And the contribution of jurisprudence elucidated the current situation and discussed the prospects for possible solutions, such as the introduction of statutory licenses. The conference Archivia 2012 brought together opinions and positions of operators, both in Austria and internationally, of archiving and internet projects, statutory public and independent, non-commercial radio stations along with players in diverse fields of art, media and academic disciplines as well as politics. The conference bundled together shared interests to gain an orientation in current academic and political discourse, and to form alliances across the broad spectrum of digital archives. 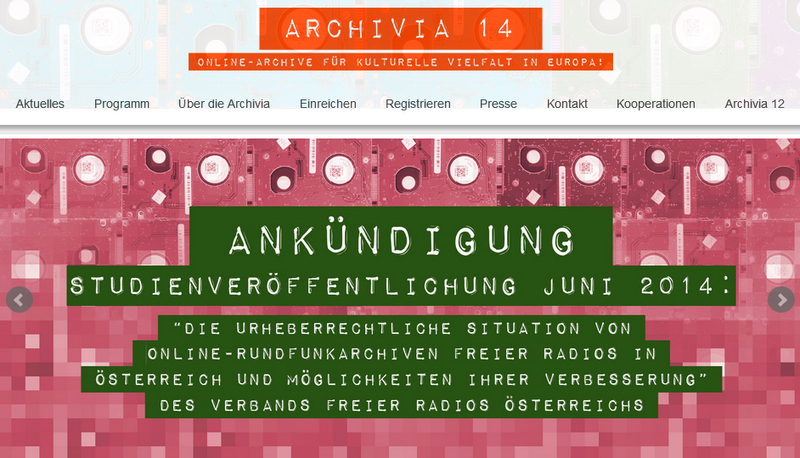 ARCHIVIA 12 was the starting-point for a networked political effort in the sense of creating such political boundary-conditions that appropriately take into account contemporary utilization and the generation of royalties and revenues from the digital cultural heritage. 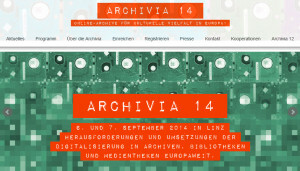 Two years later, the Archivia 2014 will continue this broad discussion and focus on practical solution strategies. It will be held on the 6th and 7th September in Linz in cooperation with the Ars Electronica Festival.